Ideas My photos all get inspiration from somewhere. But not all are directly modeled on a specific photo or technique I had seen. Most of the time I work by photographing the same subject for 1/2-4 hours, and during that time I determine what works and what doesn't. Subconsciously though, I am always influenced by some other photos or someone's style. Often I use a list of ideas because it's simple, and easy to have in my pocket. I also have a library of photos with cool compositions/lighting setups/poses or other qualities in my iPad photo library. Many of them come from my Flickr Favorite selection. I tote that along on big shoots because it has everything. For weddings/couples I have a binder filled with printed collages of couple poses I downloaded and printed. They are often better than an ipad because they can be seen properly outdoors, and are easier to handle and hand out to assistants. After inserting the SD card, I open Adobe Photoshop Lightroom 4 [beta]. My photos all are shown as a thumbnail. I select all the ones I want to import, and give them general keywords to identify them, including names of people, location and such. I have other metadata automatically filled in, like the copyright line. Lightroom imports the photos by copying the raw .cr2 files from my sd card to a folder within "My Pictures". 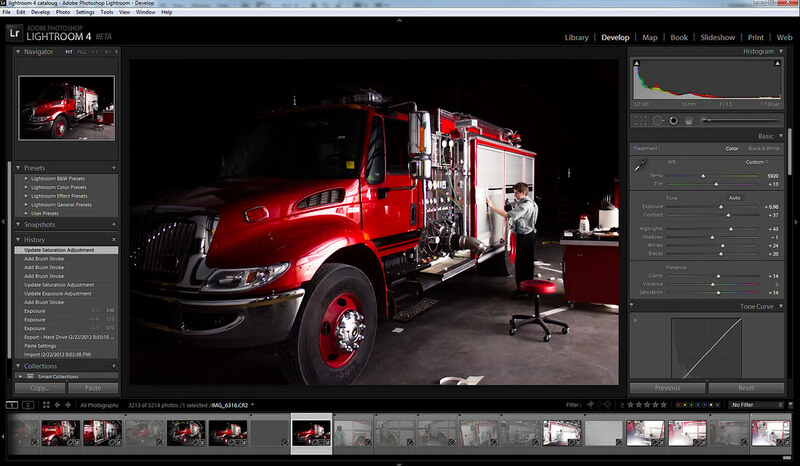 This is the Lightroom Library, where photos are sorted and so on. You can see here the "rejected photos" as being the ones that are grayed out. Editing. My preferred method of editing is to "reject" the unwanted photos and "pick" the best ones as I move along giving them a general edit. I edit the first photo to perfection, then I copy that style, and paste it on all similar photos. So now I have the junk weeded out, and a preliminary style applied to all photos. I then go though and give each photo a fine tuning, for each one is inherently different and need a special treatment. I never use presets from a list of presets, for I find that I can't get any that work just for the photos I have, unless I want them to look wacky. I have them only for black and white photos, whereby color is not an issue. If photos need extensive editing I open them in Photoshop, give them their edit, and save back to Lightroom, keeping all the photos in one place. If I shot a series of nearly identical family photos I then rate the photos by star ratings. Giving the photos with more "acceptable expressions" a higher star rating. This makes it easier to pick the best one from the whole group. I have occasionally needed to find the best photos in my whole Lightroom library, and for that I use color ratings. Giving the best photo 1 of 5 possible color ratings based on beauty, story, style, and rarity. Photo storage. I have two main folders in "My Pictures", one for Raw files, one for edited jpg files. In the jpg folder there are all of last year's photos arranged by name of photoshoot as well as this year's arranged in the same manner. In the second folder there are only the current year's raw files, arranged by time of capture. Backup Backing up is fairly simple for me, but wasn't always so. I have a free program from Microsoft called Sync toy that allows me to select a source and destination folder to keep mirrored. So I pointed it to the folder of raw images in "my pictures" and these it backs up to a Drobo which has 4 hard-drives set up to mirror each other, for a total of three copies including the ones in "my pictures". The jpg's on the other hand, get backed up to both the drobo and a separate external drive for a total of 4 copies. All included I have 7 copies of any photo from this year, three of it's raw file, and 4 of it's jpg file. From last year I have 3 copies of each file. And from the pre-light room days, i have 2 copies of each file. The backup for the older files is not quite the same as this year's files. Sharing photos. Photos are meant to share, or else they rot and are never seen. The majority of mine are shared via Dropbox. Especially if I shoot a community event, I can invite all the participants of which there are frequently over 10 . It's a very simple drag and drop operation for me and for them. Love that service. Online, I use Flickr the most frequently. Uploading maybe one shot per three photo-shoots. I usually post a link to that photo on Facebook, on twitter and occasionally if deemed fit, I embed it into a post on my blog kellyhofer.com. Unless it's just one or two photos, I keep away from emailing them. Sometimes if someone from the colony wants a whole batch of photos they just come pick them up with a usb drive or a external hard-drive. Uploading to Facebook is done amost but not quite as often as to Flickr.